Wed, Apr 17, 2019, 08:19 pm SL Time, ColomboPage News Desk, Sri Lanka. 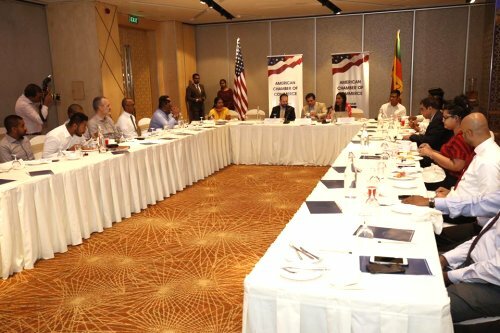 Apr 17, Colombo: The American Chamber of Commerce (AMCHAM) in Sri Lanka recently hosted the second in its "Breakfast Buzz" series with the aim of bringing together policymakers and private sector stakeholders for greater collaboration and understanding in their shared effort to expand the Sri Lankan economy. 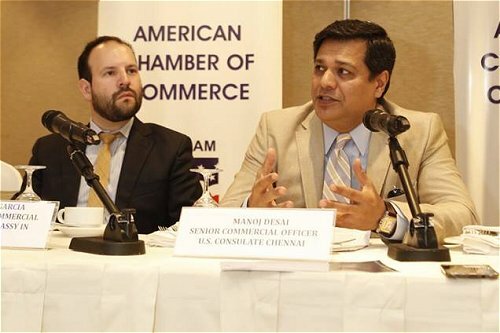 The event was titled "Opening Sri Lanka to the World," with key insights from Manoj Desai, Senior Commercial Officer, U.S. Consulate General - Chennai and Eduardo Garcia, Economic and Commercial Attaché, U.S. Embassy in Sri Lanka. The exclusive event brought together participants from both the public and private sector. Speaking at the event, Mr. Desai focused on the opportunities Sri Lanka had to gain via the U.S. Indo-Pacific Strategy. He further shared his insights on frameworks required to draw and retain foreign investments in Sri Lanka, and spoke of the importance of building a conducive environment, which in turn attracts private sector investments leading towards setting up strong institutions and sustainable growth in the country. "The onus lies on both the government and the private sector to take a firm commitment to improve the business environment. Higher levels of engagement between the government and related stakeholders, like the private sector, can achieve this. Closer collaboration is something AMCHAM encourages at all levels and facilitates as well. It is only through this kind of strong partnerships and dialogue that we can work towards offering a more concrete, growth-orientated business and investment climate in Sri Lanka," said Nuzreth Jalaldeen, Executive Director, AMCHAM Sri Lanka. AMCHAM's Breakfast Buzz series serves as a platform for open dialogue, knowledge-sharing and the interaction of differing opinions among leaders in the public and private sectors, key decision-makers and the media. The series will cover a range of discussion topics that will facilitate the development of Sri Lanka, such as smart policy making, modernizing regulations and the justice system, revamping Sri Lanka's education and talent management, better IP rights and data protection laws, tight anti- smuggling and counterfeit operations and creating an efficient bureaucracy.